Once registration is complete the learning begins. Colored links open tools you will use for creating websites. You know that the training you receive in any new job determines how comfortable you are doing that job. As well, the training determines how well you do your job. Car salespersons won’t do well if they can’t answer questions about the car they sell. Affiliate marketers will not succeed if they can’t build affiliate relationships. They have to know how to market products from those relationships. They have to have an internet presence to do this. Wealthy Affiliate offers training that covers everything necessary to be a successful affiliate marketer. Its absolutely essential that you take all ten starter lessons as you begin your Wealthy Affiliate journey. The lessons are about 20 minutes in length. You can take them quickly reviewing the information as necessary or take one lesson daily. An amazing thing will happen as you take the first 10 lessons. You will develop a website. You will create website content. You will develop affiliate relationships. Click the green button for the first free lesson. Then begin. There are 3 parts to every lesson. The practice assignments are completed before moving to the next lesson. 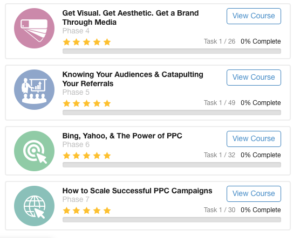 As you complete the practice assignments, your website grows. No lesson can be skipped. There are ten lessons in the Starter Course. Complete the courses and do the practice work to create you a website. You can’t start the next lesson until the one you are on is completed. Its easy to go back to any lesson at any time. Wealthy Affiliate is the only web hosting site providing in depth training. Lessons are not theoretical or technical, but practical and easy to apply. The tenth lesson reviews the first nine lessons and outlines next steps. The premium program is briefly discussed as well as other important steps to becoming an affiliate marketer. For the first week of the Starter Membership, all the WA tools are available to you for you to try them. All lessons can be reviewed at any time with any level of membership. As a premium member you can access all of WA: tools, chat and lessons for creating websites and your internet business. There are many lessons like the one below presented by the WA founders. Live webinars are also part of the premium experience. WA members present trainings on every topic imaginable related to website development and affiliate marketing. The premium membership costs $49 monthly. Annual payment is about $25 monthly. With access to all of WA plus 25 free websites and multiple .com, .net or .org sites, this fee is a bargain. 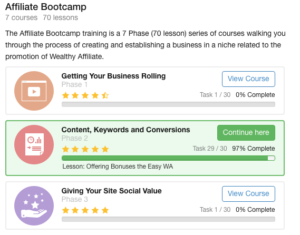 As you get started, you will experience your affiliate marketing business developing with every lesson you complete. You can see a great display of affiliate marketing by clicking on the shopping category in the sidebar of the home page of this site. Any banner you choose will allow you to buy any product offered by that retailer. Take a moment to share you thoughts on what you read on this page in the comment section of the home page. 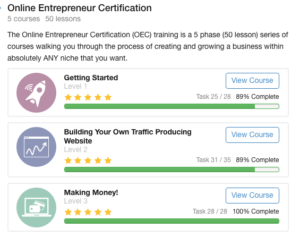 Have you taken a starter course on developing a website? Do the 10 trainings interest you?